Home Travel Inspiration12 hours in... 12 hours in… Santiago de Compostela! Welcome to Santiago de Compostela! If you’ve ever walked or cycled the ancient Camino de Santiago, then this incredible city will need no introduction. 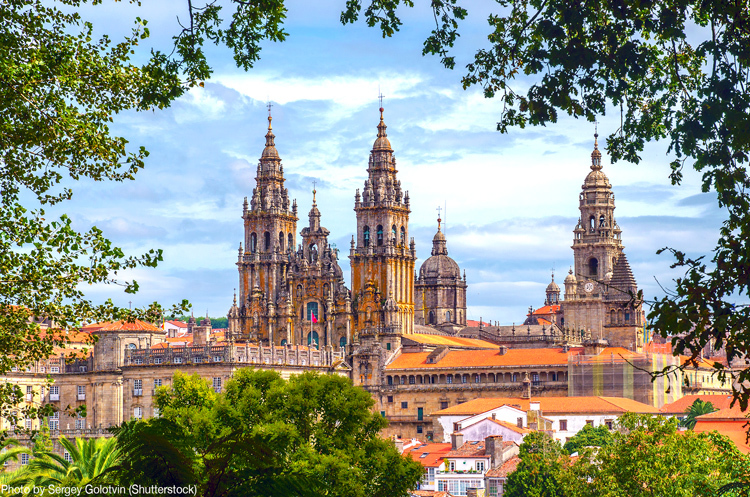 The capital of northwest Spain’s Galicia region, Santiago is the final destination for several of our Camino cycling tours, and is the perfect reward for the achievement of completing this world renowned pilgrimage. Steeped in culture, culinary delights and captivating sights, this unique city has it all and more. The first place you should head to is the Praza do Obradoiro. This is the main square in the old town and is a hive of activity, often enveloped in a symphony of bagpipes which welcome pilgrims after their long journey. Located to the west of the famous Santiago de Compostela Cathedral, the square is a fascinating people-watching spot as such an array of different folk gather and celebrate; such a sense of camaraderie and joy are classic Skedaddle ingredients! One of the most interesting times of year to visit the square is on July 25, when it hosts an exciting array of St. James’ Day celebrations. These celebrations include an elaborate firework display the night before the feast day, along with a variety of other incredible cultural events you won’t want to miss. 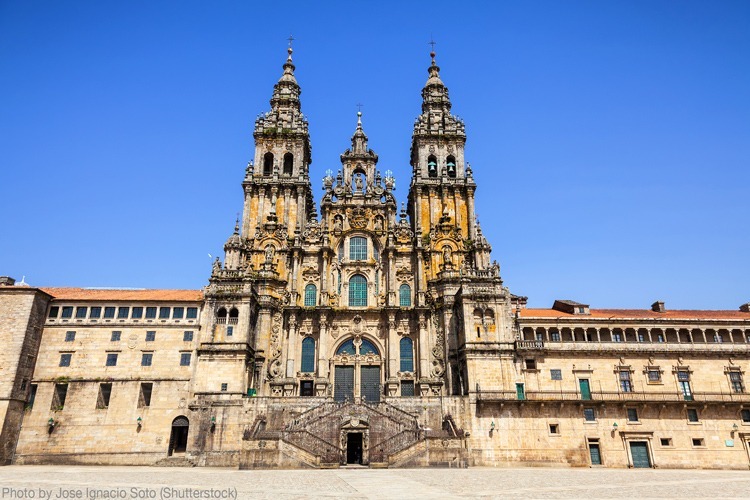 The focal point of the city has to be the Santiago de Compostela Cathedral – a roman-esque structure with elements of Gothic and Baroque architecture. The cathedral is the reputed burial place of Saint James the Great, one of the 12 apostles of Jesus Christ, and is one of the main attractions that entices holidaymakers from across the world to this small city. For those drawn to heights, there is the option to walk up to the cathedral rooftop to get an awe-inspiring, 80m elevated panoramic view of Santiago. Recognised as a UNESCO heritage site since 1985, this historical town has no shortages of other incredible buildings and Baroque architecture. Notably, many of the university buildings, some dating back to as far as 1495, make up one of the oldest universities in Spain and in fact across Europe, being 522 years old as of 2018. This city is not only known for its history however, with Santiago also being a fantastic place for the avid shopaholic. The quaint streets of the old town are home to local gastronomic delicacies as well as the local craft of silverware and the jet stone – a black mineral stone which led to coining the phrase ‘jet black’; it was used in the Egyptian and Roman times as a protective stone. Santiago is also home to a variety of street markets, shopping centres and the El Ensanche shopping area which is a large expanse of shops which are best experienced on foot. Furthermore, the Alameda Park is a great green space that is central to many of Santiago’s celebrations, but also has a peaceful aspect for a calm stroll, and a stunning view of the Cathedral from Paseo de Ferradura which is located on the hillside of the Santa Susana hill. Here you can also find the Monument to ‘As Marías’; A bronze sculpture depicting two sisters who lived in the late 20th century and used to walk in the park every day wearing clothes not commonly seen for their time. The bustling Mercado de Abastos is one of the largest traditional street markets in Europe and is Santiago’s 2nd most visited attraction after the Cathedral. Locals bring fresh food of all kinds, whether it be fruit like figs and oranges, or seafood such as prawns, sardines and even whole octopuses. This is truly a foodie’s heaven! From the Cathedral, you may also want to wander down the bustling street Rúa do Franco, named for the French pilgrims who used to stay there. It is here where you will find some of Galicia’s best traditional restaurants serving delicious local foods and tapas – the perfect spot to enjoy a legendary lunch! – Pulpo (Octopus) – the speciality of local restaurant O Dezaseis where the octopus is cooked until tender and thrown on a hot griddle and sprinkled with smoked pimentón (Spanish pepper). 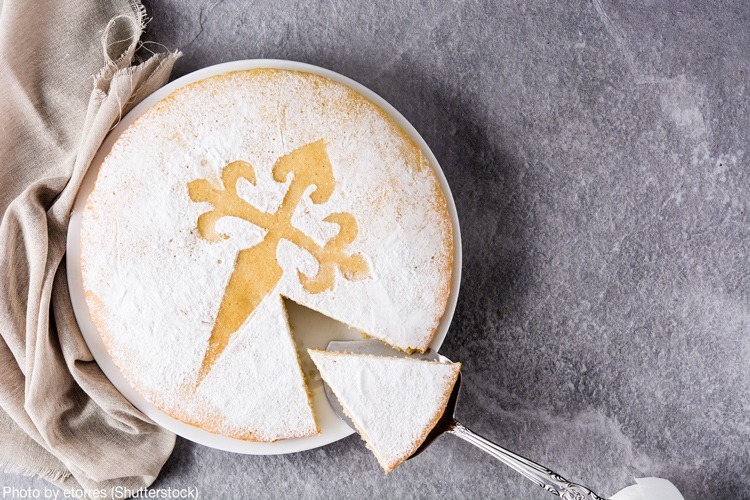 – Tarta de Santiago – this almond pie literally named ‘Cake of St. James’ was traditionally baked as a reward for pilgrims completing their journey, but more modernly simply a regional specialty. The cake is covered in a sprinkle of icing sugar, with the shape of St. James’ cross left plain in the center. 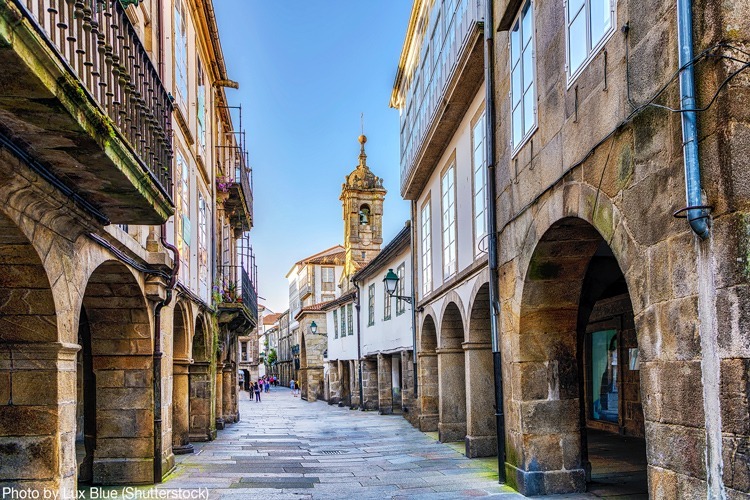 Santiago de Compostela is the final destination for several of our cycling holidays in Spain, so you will always have an option to stay a bit longer after the trip to enjoy the sights and specialties of the city! For the road cyclist, why not try the Road to Santiago tour which travels along the beautiful and dramatic Atlantic coastline of northern Spain before ending in this wonderful city. 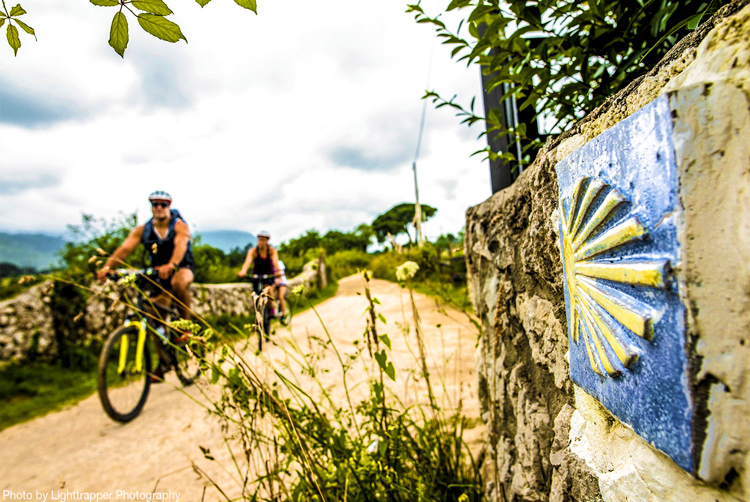 For the mountain biker, take on the wild and dramatic route of the Camino Primitivo which takes you on the little known, original pilgrim route through remote mountain ranges. And for the leisure cyclist, trace the steps of ancient travellers and cycle along the Camino de Santiago on your own steam, or as part of a guided group of like-minded cyclists.